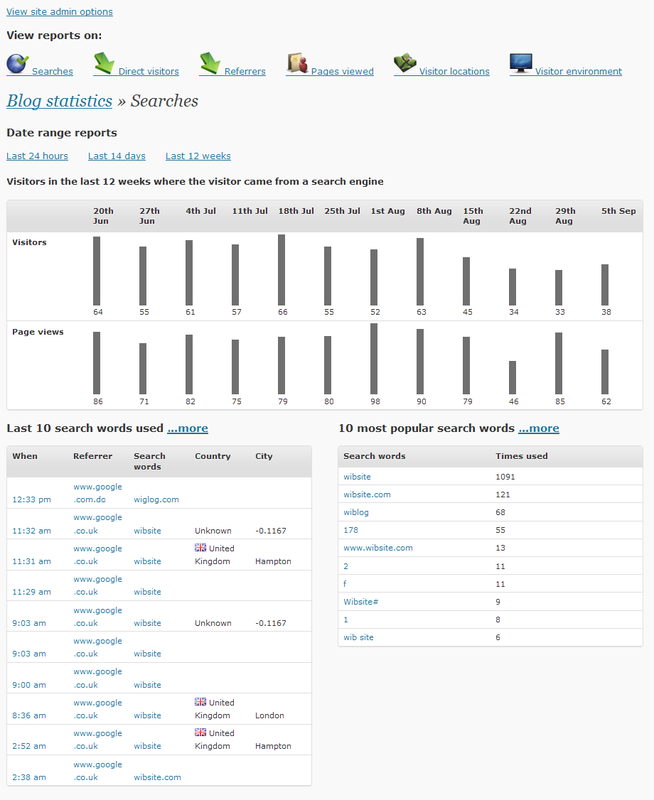 Each search term has it’s own report, showing the number of visitors and page views (last 24 hours, 14 days and 12 weeks). 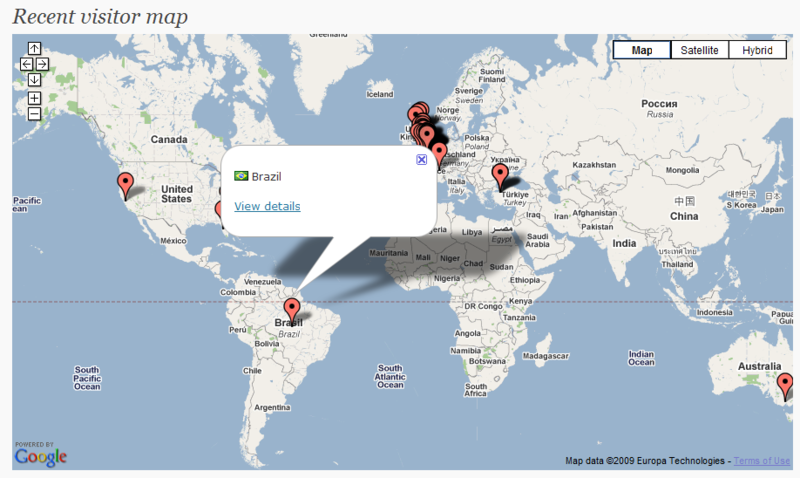 You can also see the countries visiting for this search term, and which domains sent visitors using the search term. 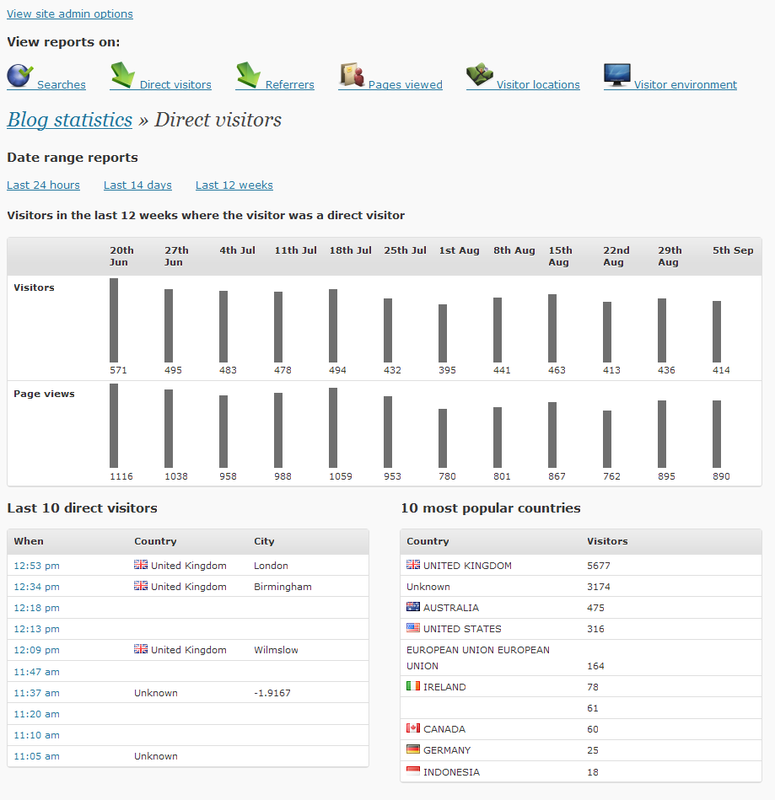 The referrers report shows the number of people visiting your blog (last 24 hours, 14 days and 12 weeks) where they have come from a link on another website (not a search engine). 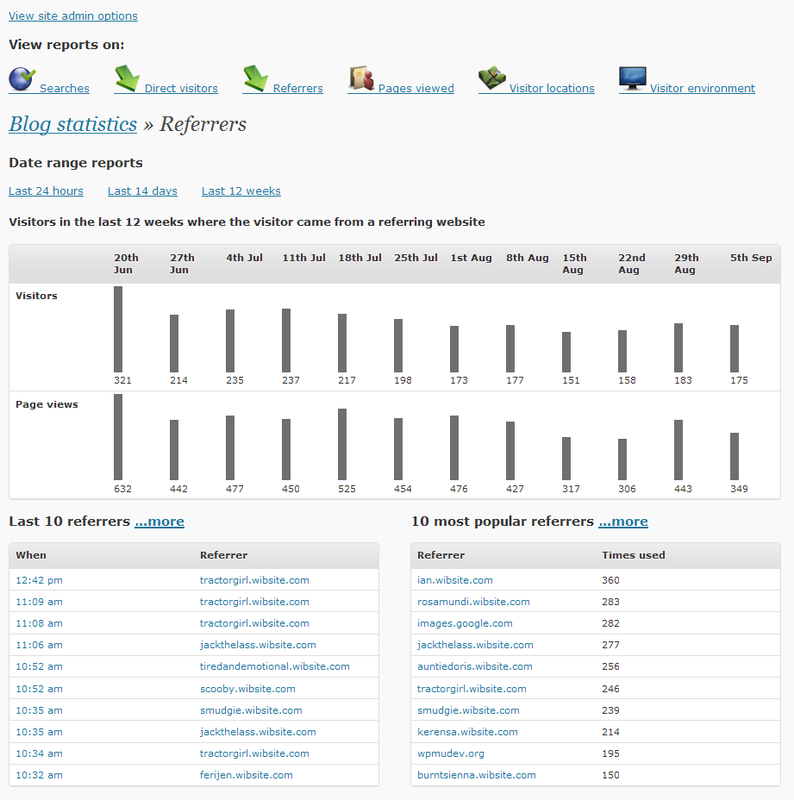 The last 10 referrers and 10 most popular referrers are shown, and longer lists of both of those are available. And there’s a report for direct visitors (ones where they have you as a favourite, or they typed your address in directly). Again, last 24 hours, 14 days and 12 weeks. 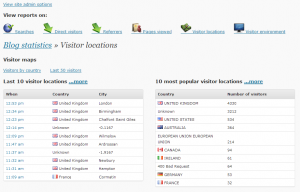 This report also shows the last 10 direct visitors, and the 10 most popular countries for direct visitors. Visitor locations shows where people have come from. 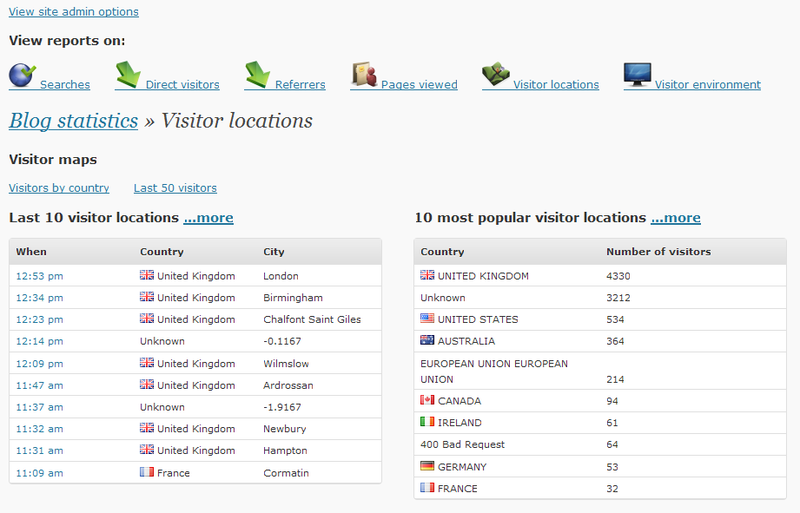 There are two maps available: visitors by country (how many people have visited from each country) and last 50 visitors. The recent visitor map shows the last 50 people visiting your site for whom the system could determine their geographic location. It’s not perfect, and it’s also not possible to get the location of every visitor, but maps are always cool. 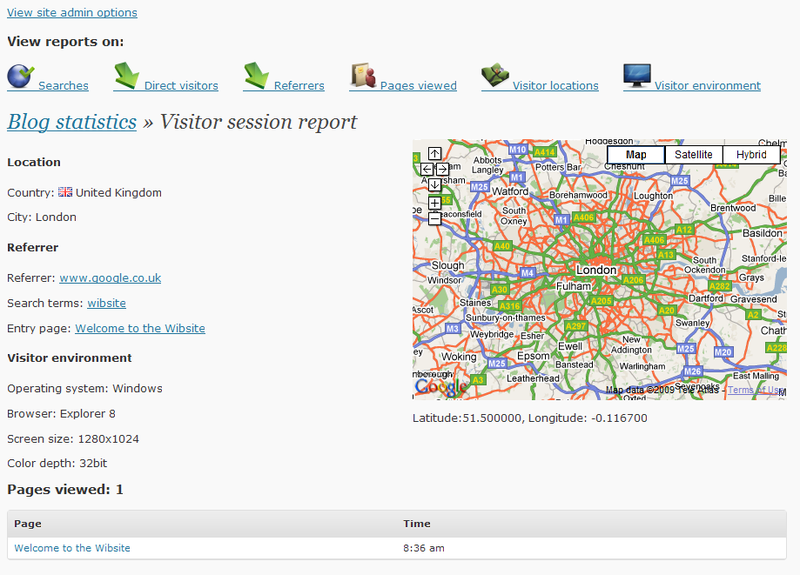 Click an icon to see the details for that visitor (and go to their session report … more on that later). 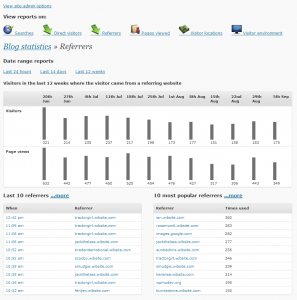 The content viewed report shows what pages in your blog are most popular. 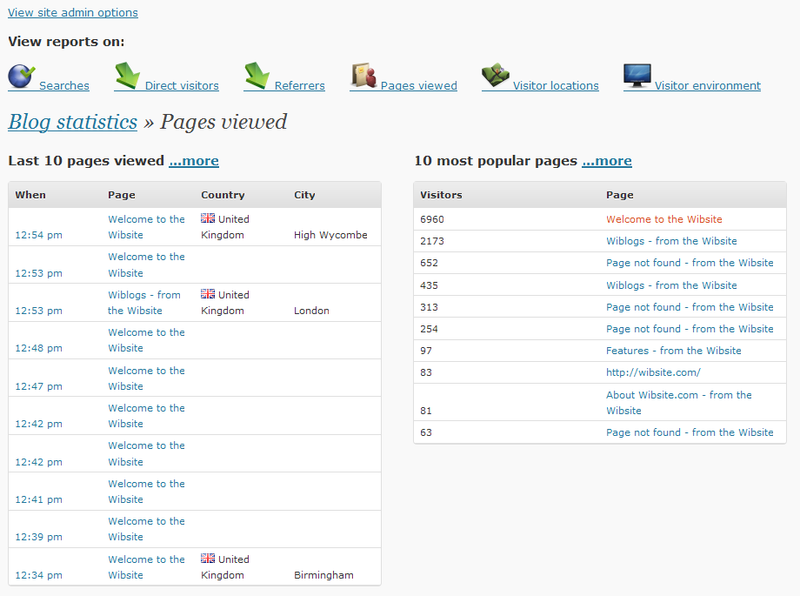 The last 10 pages viewed (with a longer list) and 10 most popular pages (with a longer list) are shown. 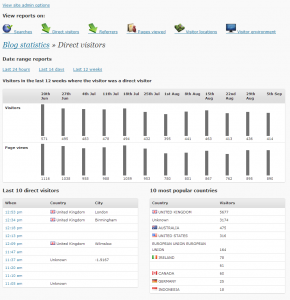 Each page on your blog also has it’s own report, showing the number of visitors and views (last 24 hours, 14 days, 12 weeks). You can also see what countries have been visiting the page, and the most popular search terms which brought people to that page. 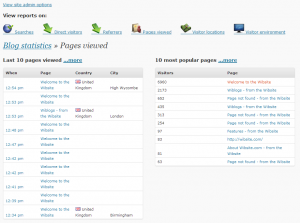 For the geeks among us there’s also a report showing the visitors environment – browser, operating system and screen size. If you see lots of visitors with large monitors, running Apple computers, you know you have a rich set of viewers. 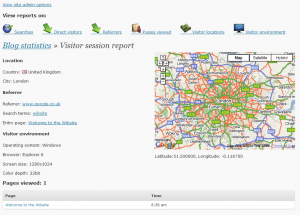 Finally there is a session report which shows you all you want to know about an individual visitor. Where they came from, their search words, their location (if it could be got), their environment and the pages they viewed. 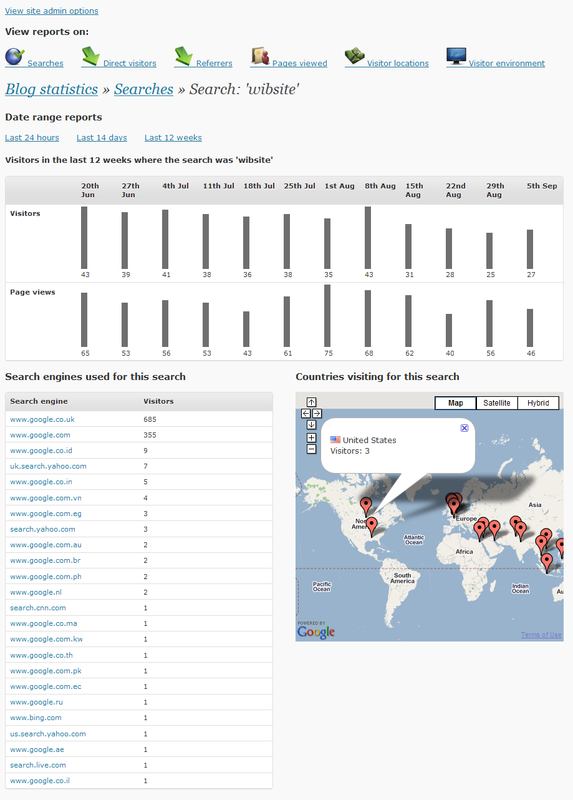 It even shows a list of other sessions from the same IP address, so you can get all Big Brother on them. 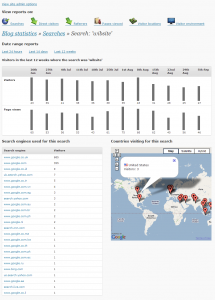 Geo-location information is provided by the free APIs by hostip.info, iplocationtools.com, ipmango.com and pidgets.com, to whom I extend my grateful thanks. A random API from the list is chosen for each session to try to spread the load, but please visit and enter your location (if it’s not correct) and think about donating – especially if your site is busy and will cause a lot of load on their servers. Please note: Wibstats requires the wp_footer action to be used in your page – so if it isn’t there (normally in your footer.php file) please add it or you won’t get stats. Using several different geo-location APIs randomly chose for each session; this will lighten the load on hostip.info – done! The plugin is available for download from my page in the official WordPress plugin repository. 0.2: June 7, 2009: Added iplocationtools.com and ipmango.com geolocation APIs. 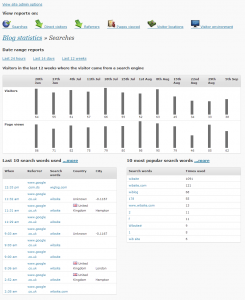 Plugin now hosted in the official WordPress plugin repository.